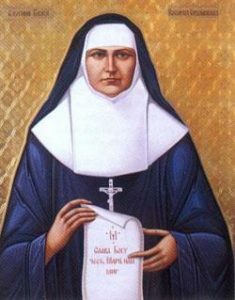 Blessed Josaphata Michaelina Hordashevska (Yosafata Mykhailyna) was born on November 20, 1869, Lviv, Ukraine and died on April 7, 1919, Chervonograd (a. k..a. Krystonopol), Ukraine. Until Josaphata, the only option for a Ukrainian Catholic woman who wanted to lead at consecrated life was a contemplative order. Michaelina, as she was baptized, was about to enter such a contemplative order when she was invited to assist two priests who were forming a new apostolic congregation. In 1892 she became the first member of the Sisters Servants of Mary Immaculate and took the religious name Josaphata in honor of the Ukrainian martyr Josaphat Kuntsevych. With no tradition to guide her, Josaphata simply looked for what her community needed and came up with solutions. The Sisters Servants cared for the sick, founded daycare centers for children, taught adults the basics of Christian living, cared for neglected village churches, and sewed church vestments. Living in a village without a doctor or a pharmacy, Josaphata even learned to mix medicinal herbs and medications. Josaphata’s contributions were not always appreciated. Some priests and even some sisters did not believe that a woman could govern a congregation. She was forced to resign from the office of superior general and was twice denied permission to make her final vows. In 1909 she was barred from her own General Chapter meeting because only Sisters with perpetual vows were permitted. On May 10, 1909 the Sisters elected Josaphata vice-general in absentia, and she finally pronounced her perpetual vows the following day, seventeen years after she had cofounded the congregation. She died, leaving more than fifty foundations, some as far as Canada and Brazil. Josaphata has become known as a powerful intercessor. More on her canonization process is found here.